Every morning, they clustered in groups around his stall in Doug O’Neill’s barn, appropriately the first one where he was easily visible to all who passed by. The question was asked at least a hundred times by watchful bystanders. Meanwhile, just a few stall doors down, a small, quiet chestnut colt was left in solitude as he delved into his feed tub. That colt was I’ll Have Another, who would go on to win the Kentucky Derby and give O’Neill and young jockey Mario Gutierrez their first Run for the Roses victory. No, the star of the show the week leading up to the big race wasn’t a contender – it was a legend of races past. 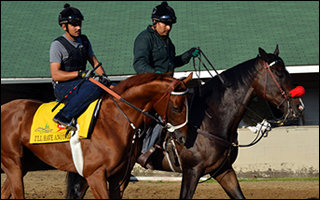 Lava Man, a retired 11-year-old gelding who earned more than $5 million over the span of his racing career, was embarking on the toughest challenge yet of his new job as track pony for I’ll Have Another. His assignment was to lead the son of Flower Alley to his date with destiny on Derby day, but he also inadvertently served another purpose. With fans flocking to catch a glimpse and take pictures of one of California’s most recognized champions, O’Neill’s Derby hopeful went mostly unnoticed, despite his brilliant gallops that outshined his more familiar rivals during Derby week workouts. Early in the week, before the large crowds had arrived, Lava Man made his way from the barn to the track for what would be one of many photo shoots. As the tractor pulling the starting gate rolled by, Lava Man began pawing the ground with his hoof and chewing incessantly on his bit. Could it be that he was recalling his lone visit to Churchill Downs, when he finished seventh in the 2006 Breeders’ Cup Classic? While he made many friends during the week, none proved more devoted than Churchill Downs racing analyst Jill Byrne. Byrne climbed aboard Lava Man for a ride nearly every morning. It became a regular occurrence to see the two touring the backstretch together, with Lava Man appearing to enjoy his meet-and-greets at various barns. “There’s going to be a horse-napping,” Byrne would kid. Some fans were lucky enough to get a close look at their hero. Lori Height of Indiana, sporting a Lava Man baseball hat and three forms of photo-taking equipment, was a fixture at the barn – and anywhere else the gelding went. Lava Man had accompanied I’ll Have Another to the gate for the Santa Anita Derby, but he passed his first test underneath the Twin Spires when he practiced on Kentucky Oaks day with Unex Dali, who finished second in the second race. When the big moment arrived, Lava Man was all business. A bit excited, he seemed to be trying to “pep up” his buddy as they worked their way through the gap and onto the track. As the roar of the record crowd of 165,307 echoed through the air, Lava Man‘s ears shot straight up and he began to strut. I’ll Have Another, seemingly unaffected when being led from the barn, caught a spring in his step as well. “He was on his toes but not hot, just excited,” O’Neill said. “He’s a very energetic, happy 11-year-old that still has a lot to give. As anticipated, the veteran warrior accompanied racing’s newest star to Pimlico, where he will attempt to win the Preakness, the second leg of the Triple Crown. “He’s starting to enjoy shipping,” O’Neill said of Lava Man. “Still, if he had his druthers, he’d probably be in his comfortable stall at Hollywood Park. He looks great and is always happy to go to the track. Lava Man had “the talk” with IHA…pumped him up, lucky guy riding that horse, & I do mean Lava Man, one of the best ever!!! I do believe Lava Man was THE story at the KY Derby this year. It has been years since I saw Lava Man at the 2005 BC at Churchill Downs when he came in 7th….definitely didn’t enjoy the travelling. Lava Man is sired by the best ever, the great, one and only undefeated TC winner, Seattle Slew. All the best to Lava Man and IHA and the Doug O’Neill team. Godspeed!